Several influential Parties were supportive of global schemes for aviation/shipping with no net incidence on developing countries, as recommended in the AGF Report (1 MB) (detailed in the AGF paper on International Transport ). Our rebate mechanism is described/endorsed in the paper. Below is our summary from Cancun. The United Nations Climate Change Conference (COP16/CMP6) was held from 29 November to 10 December 2010 in Cancun, Mexico. In advance of the COP16/CMP 6 conference, both the International Civil Aviation Organization (ICAO) and the International Maritime Organization (IMO) worked hard to convince the international community that they were making good progress on pursuing the reduction or limitation of greenhouse gas (GHG) emissions from international aviation and maritime transport, respectively. Both argued that they should be entrusted with continuing their work, and should do so according to their global rules and provisions. Both organizations have however failed thus far to reconcile the UNFCCC principles of equity and common but differentiated responsibilities (CBDR) - to be applied at the country-level - with uniform rules, that apply at the vessel/carrier-level. 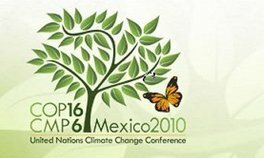 Some NGOs and countries hoped that the report of the UN Secretary-General’s High-Level Advisory Group on Climate Change Financing (AGF Report (1 MB)) published 5 November 2010 would help to progress the negotiations on international transport in Cancun. The report recommended that any scheme generating revenue for climate action should have no net incidence on developing countries (i.e. zero cost burden). The report recommended putting a price on GHG emissions from international transport, with no net incidence on developing countries, thereby effectively endorsing a certain way of implementing CBDR in international transport. For shipping, the report highlighted a rebate mechanism for developing countries proposed in the IMO (detailed in the AGF technical report 2); for aviation it suggested that universal application may also be more appropriate, supported by compensation options for vulnerable least developed countries. The general position of developed countries was to eliminate CBDR from a future regime for international transport, while the position of developing countries was the opposite: defend CBDR as the cornerstone of UNFCCC. Furthermore, many developing countries also argued that a uniform approach could constrain their trade and development, and could burden them with additional costs. Overall, the negotiations under the mitigation agenda were highly contentious. The financing discussions never took place, as a relevant opportunity did not materialize. There was no outcome on international transport at COP16/CMP6. There is no reference to international aviation and maritime transport in the Cancun Agreements (AWG-LCA and AWG-KP ). Negotiations of the sectoral approaches, comprising agriculture and international transport, were highly contentious. Parties were unable to agree the framing paragraph for the sectoral approaches, in the LCA section 1 b(iv). In fact this prevented specific discussions on international transport, as Parties declined to discuss it until the framing paragraph was agreed. The key issue was whether the principle of common but differentiated responsibilities and respective capabilities (CBDR) is referred to in the framing paragraph, and thus applies to sectors, including international transport. Presentations from some of the side events are available (UNFCCC website). There were also informal meetings/dinners with invited negotiators and influencers. Given that the AGF Report was noted at the Cancun Agreements, and no separate financing review was mandated, approaches such as the rebate mechanism in shipping that would deliver zero net incidence on developing countries are gaining increased traction. They could break the deadlock on emission reductions from international transport, and simultaneously provide a predictable source of significant finance ($10bn+ annually). Given our discussions with representatives from over 50 countries, we are cautiously optimistic regarding progress in international transport in 2011 (especially in shipping). We are actively pushing for it, and are looking for financing support to make the progress a reality.